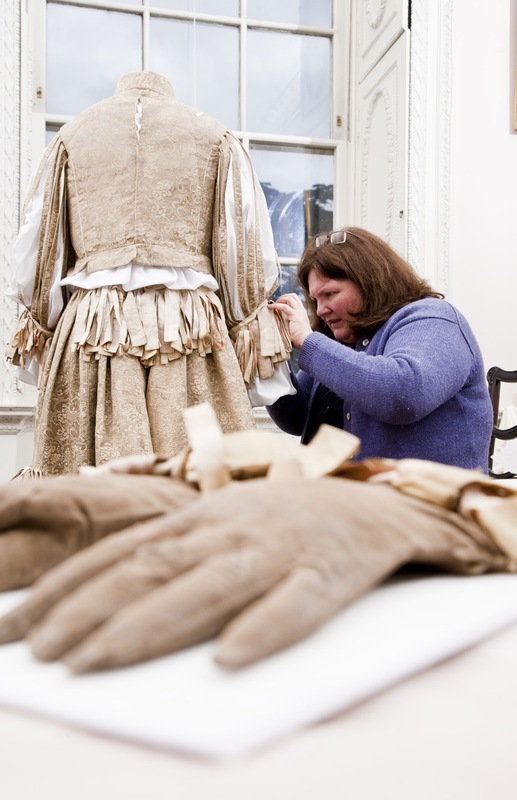 Rosamund Weatherall completed her MA in Textile Conservation at the Textile Conservation Centre in 2005. In the first year Rosamund was introduced to “many of the core skills required to make an assessment of the condition and subsequent treatment of a textile artefact” while in the second she focused on advanced conservation techniques. Her projects included treating a black silk dress (c1905) which had suffered significant damage. The treatment involved the removal of adhesives, withwhich it had been repaired, and resupport of the affected area. She alsoworked on “a fragment of a Paisley-style shawl forming a decorative panel in an organ, which had suffered soiling and significant damage… The project was both challenging and fascinating as in discovering the history of the manufacture of shawls of this type I was able to give a more informed treatment to the fragment”. Rosamund said “The course has developed my understanding of the techniques used in textile conservation within an ethical framework. I am confident that it has equipped me to make an immediate contribution to the profession”. Since graduating Rosamund has worked at the National Trust’s Conservation Studio in Blickling, where she is now Senior Conservator.